A joke doing the rounds on the internet is that while Michelle and Barack Obama were at a simple restaurant, the owner requested a private conversation with the first lady. Like many jokes, this reflects a view held by many: that Michelle has had a commendable impact on Barack’ s success as the first black president of the US. Numerous presidents and leaders around the world are confirmation of the axiom “Behind every great man is a great woman”. 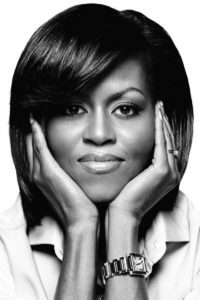 But Michelle Obama consistently stands out as an American first lady who has gained a tremendous following and respect around the world. I believe the respect and admiration she has won is the result of her ability to build a powerful personal brand. This is something that we can all learn from, especially women. In the spirit of Women’s Month, let’s remember the notable local and international women who have proved that building a powerful personal brand is not something reserved just for men. Women can also have strong brands and can reap the resulting benefits. When people describe Michelle, the words most often used are “powerful”, “confident” and “integrity”. This is thanks to the efforts she has made to be consistent in the way she portrays herself – from public appearances, to the content of her speeches and the kinds of career choices she makes. The lesson for anyone building a personal brand in the context of business is that the strength of your brand relies on your ability to consistently live up to the qualities your brand stands for – whether it be in public or in your private life. It is much easier to be consistent when the brand is authentic to who you are. So often we see our leaders in business and in politics being embarrassed by the scandals that emerge about them – scandals that are utterly inconsistent with the public images that they try to portray. A personal brand is not a marketing idea of who you hope to be: it is a representation of who you are. The second key element of Michelle’s brand is that she did not become a shadow of herself in an effort to help or stand by her husband. In fact, both she and the president have benefited from her maintaining the outwardly powerful presence that she consistently portrays. In the past, the words “powerful” and “confident” would traditionally not be associated with women next to the men at the top, even though manyof us know that the presence of these women plays a key role in the men’s success. For example, the fact that Hillary Clinton is the presidential candidate for the Democratic Party in the USis a testament to her leadership abilities. One can assume that these same abilities were critical to the success of husband Bill’s election campaign and his presidency. But few would have credited her with these skills back then, because her image was of a supportive first lady, not the competent presidential candidate we see today. Women may not be holding all the top seats in business either, but there are a number of them behind successful male CEOs. In the past, the norm may have been to lie low and remain in the shadow of the men leading us. But it is time we started encouraging the opposite behaviour. America’s first lady has proved that this approach canbe beneficial, not detrimental, to the brands of everyone involved. Let us all start reaping the benefits that come with letting our power be known. There is no shame in displaying your power in a manner that is true to your feminine nature. Michelle Obama’s brand is both powerful and feminine. We live in a world where power is often associated with masculine behaviours. This first lady has shown us that you can indeed build a brand respected for its power, while being authentically feminine at the same time.